Education Services are provided by West Sussex County Council. There are a number of Primary Schools within the area of the Parish. Secondary and 6th form education is provided by a number of establishments outside of the Parish. The application process for children due to start school in September 2018 will begin on 2nd October 2017. 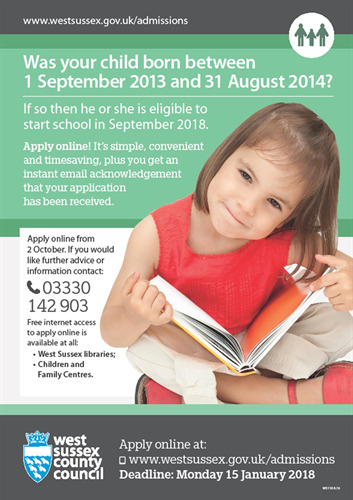 West Sussex County Council no longer sends individual letters to parents but is advertising the application arrangements as widely as possible. Are you aware of a child in your Parish who would benefit from a boarding education, regardless of family means? Christ's Hospial near Horsham, invites applications for bursary places which can cover up to 100% of boarding fees. Year 5 pupils who are considering secondary education in September 2018 are invited to apply. John Franklin, Head Master said "All candidates applying for a place will be assessed on their potential, both academically and in a number of other areas. Those warded places will gain the benefit of an outstanding education opportunity at Christ's Hospital. Currently, 75% of our boarders receive a means-tested bursary; 14% (117 pupils) receive a free place and one-third of parents pay less than 10% of the boarding fee. Means-testing helps to ensure children from all walks of life have the chance of this opportunity. Being part of a boarding school community is a life chaninging adventure that many children will only have dreamt or read about." The closing date for applications for September 2018 entry into Year 7 is Friday, 15 September 2017.